The 27th Amendment is about limiting Congressional Pay Increases. Summary: The 27th Amendment was ratified in 1992, during the administration of George Herbert Bush, limiting how Congress can increase how much its members are paid. Amendment XXVII was originally proposed on September 25, 1789 and was ratified on May 7, 1992. 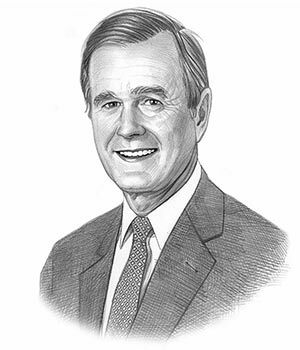 George H Bush was the 41st President of the United States whose presidency spanned from January 20, 1989 to January 20, 2001. One of the key events during his presidency was the ratification of the 27th Amendment to the Constitution. The cause or reason for this addition to the Constitution was to ensure that the current Congress could not raise their own salaries. This was to address concerns that members of Congress might choose to act in their own interests rather than in the public interest. The words had been written by James Madison and submitted in 1789 as one of his original 12 amendments – 10 amendments were ratified which later became the Bill of Rights. An undergraduate student at the University of Texas named Gregory Watson agitated for 20 years nad was instrumental in get it passed. Explanation & Meaning: Members of Congress may not immediately raise their own salaries. Any salary increases are postponed until after an election. The above information provides the text, definition and summary of the amendment. The following George H Bush video will give you additional important facts and dates about both the personal life and political life of the 41st President of the United States whose presidency spanned from January 20, 1989 to January 20, 2001.